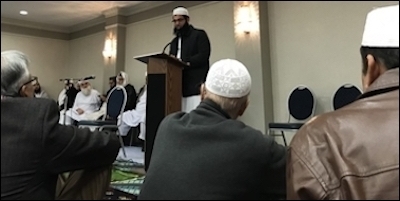 On November 18, clerics and congregants from Islam's Deobandi movement met in Alexandria, VA, to denounce and threaten Ahmadiyya Muslims, a peaceful and much-persecuted Islamic group. The conference, which was livestreamed, featured Pakistani, American and Canadian clerics from the Deobandi sect, an Islamic movement first established in South Asia. 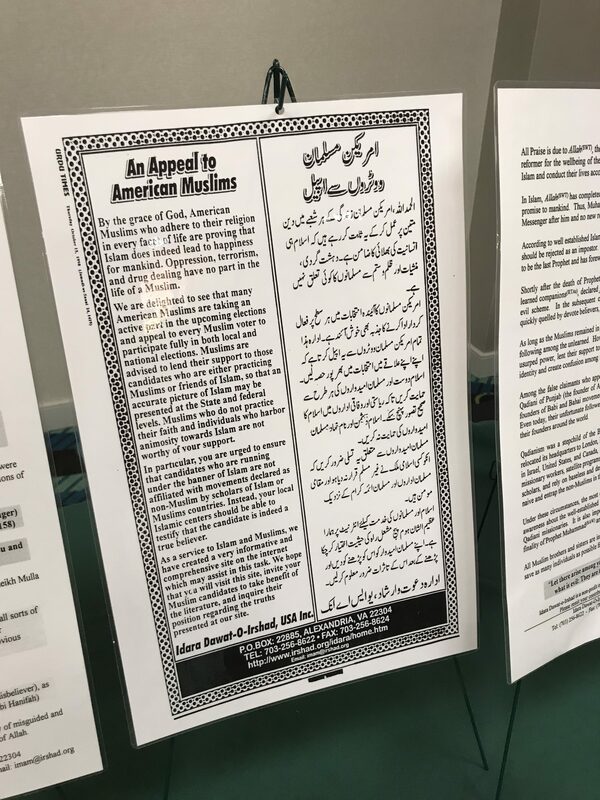 An American Deobandi imam from the Noor Mosque in Springfield, VA, told the conference that Ahmadis had conspired to stop Muslims from "fighting Jihad and committing bloodshed." For most audiences, this would be an endorsement. But not at this conference. Undercover footage taken by Ehsan Rehan, editor of the Rawbah Times, reveals speakers claiming that Ahmadi Muslims are "infidels," condemning America as "land of infidels" and stating: "They are ignorant and there is no need for dialogue with them. God has given them two options: one is the holy book and one is the stick, and if one does not accept the holy book they have to be forced." Literature at the conference urged supporters not to vote in elections for non-Muslim candidates, including those Muslims "declared as non-Muslim by scholars." 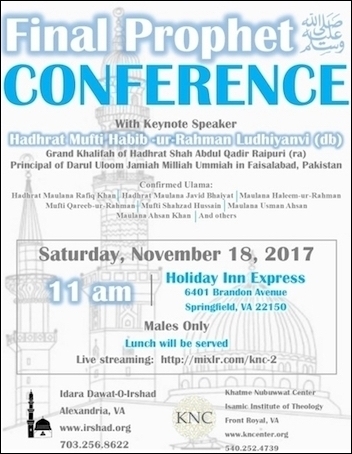 The conference was organized by two Virginia institutions, both of which enjoy tax-exempt status: Idara Dawat-O-Irshad and the Khatme Nubuwwat Center. Both organizations openly incite hatred against Ahmadi Muslims. And as the name of the latter illustrates, both mosques are affiliated with Khatme Nubuwwat (KN), an international organization headquartered in Pakistan, which exists solely to incite hatred against Ahmadi Muslims. "Khatme Nubuwwat" means "Finality of the Prophecy" – referring to the tenet held by most Islamic sects that there can be no prophet after Muhammad. Ahmadi Muslims, however, believe there was in fact another prophet after Muhammad. This belief, the KN conference was told by Canadian imam Usman Ahsan, is "enough to wage war" against them. Pakistani cleric Qareeb ur Rehman added that "those who claimed prophethood after Prophet Muhammad were not only given death sentences but were actually killed." Another Pakistani cleric, Habib-ur-Rehman Ludhianvi, urged American Muslims to go before American courts to "explain that Qadianis [Ahmadis] are disrespecting Islam ... It should be made criminal for them to do so." The conference in Virginia took place just a day after Pakistan's National Assembly voted to restore laws requiring Ahmadi Muslims to "sign a declaration stating [their belief], failing which their name shall be deleted from the joint electoral rolls and added to a supplementary list of voters in the same electoral area as non-Muslim." The law is known as the "Khatme Nabuwwat declaration." Syed Ejaz Hussain, Terrorism in Pakistan: Incident Patterns, Terrorists' Characteristics, and the Impact of Terrorist Arrests on Terrorism, University of Pennsylvania, 2010. KN is run by clerics and followers of two South Asian Islamic sects: the Deobandis and the Barelvis. The Deobandis are a hardline sect from which the Taliban spawned. 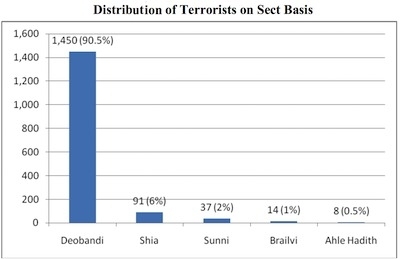 According to research conducted by Dr. Ejaz Hussain at the University of Pennsylvania, in Pakistan, although it is estimated only about 20% of Muslims are Deobandi, an astonishing 90% of terrorist operatives are from Deobandi backgrounds. The Barelvis, meanwhile, are generally (and perhaps mistakenly) considered to be more moderate. They are vehemently opposed to Deobandis, and a great deal of Pakistani politics revolves around the violent enmity between the two sects. Despite these internecine hatreds, however, both the Deobandis and Barelvis put aside their differences for one cause: inciting violence against Ahmadis. KN is the product of this unholy alliance. Across the world, Ahmadis have been attacked, forced out of their homes and subjected to oppressive laws targeting them for their beliefs. KN is behind much of this. In Pakistan, simply to be an Ahmadi is to be guilty of blasphemy – a crime that, partly because of the continued lobbying by KN, remains a capital offence. Since the 1950s, in fact, KN has continuously organized anti-Ahmadi riots and attacks and lodged blasphemy charges against Ahmadi activists. Today, KN distributes leaflets in both Pakistan and Britain advocating that Ahmadis should be killed. Deobandis and Barelvis put aside their differences for one cause: inciting violence against Ahmadis. Extremists listen to this invective. In 2010, Deobandi terrorists murdered over 90 Ahmadis in simultaneous attacks against two Ahmadi mosques in Pakistan. In 2016, an Ahmadi shopkeeper named Asad Shah was stabbed to death in the Scottish city of Glasgow. Just hours before he was murdered, Shah wrote "Happy Easter" on his Facebook account to his "beloved Christian nation." The murderer, Tanveer Ahmed, belonged to Dawat-e-Islami, an extreme Barelvi group that has endorsed KN. In response to Shah's killing, the British branch of KN applauded the crime and stated: "Congratulations to all Muslims." This violent international network has found a home in the United States. Other KN mosques include Darul Ifta Khatm-e-Nubuwwat in Queens, NY; Masjid Khatm e Nubuwwat in Brooklyn; and Aalami Majlise Tahafuze Khatme Nubuwwat in San Gabriel, CA. These are just the ones we know about. There may be many more. How long will it be before, just as in Scotland, an American Ahmadi Muslim is murdered for his beliefs? Journalists, politicians and faith leaders in America are endlessly searching for Muslim partners. Often, they turn to Islamists who deceptively present themselves as the leaders of American Muslims, from whom they have no actual mandate. What better way for policymakers to promote moderate Islam than by embracing Ahmadi Muslims? The truth is that Islam is incredibly diverse. It comprises many dozens of competing political groups and religious sects. American Muslims can be represented by no single group or movement. And just as American Islam includes extreme movements such as the Deobandis and KN, there are also moderate and tolerant groups, such as the Ahmadiyya. In the fight against Islamist terror and the lawful extremism that underpins it, America needs Muslim allies. What better way for our policymakers to promote a moderate Islamic sect and disempower the extremists than by embracing Ahmadi Muslims? They may be a minority within American Islam, but they are no less unrepresentative than the Islamists.